Sierra Vista High School senior Jose de Leon is looking forward to participating in commencement exercises in June and pursuing a career as a probation officer. But it wasn’t very long ago that the idea of graduating from high school was more fantasy than reality for de Leon. As a freshman, de Leon spent two days at the comprehensive high school before being transferred to Sierra Vista, the District’s independent study campus. There, he was placed in the evening program, where he received one-on-one support. He now plans to attend Rio Hondo College and become a probation officer. For overcoming personal barriers, de Leon was honored with an Award of Merit by the Board of Trustees. Santa Fe High School hosted a two-day “Every 15 Minutes” program using a trio of techniques to bring home the dangers of drinking and driving: a graphic staging of a deadly drunk-driving crash, students randomly pulled from classes to represent lives lost to drunk driving and a mock funeral service on April 3 and 4. Two Whittier Union schools have been designated as AVID Schoolwide Sites of Distinction. Pioneer and Santa Fe high schools – both of which are National AVID Demonstration Schools ¬– were recognized for demonstrating outstanding commitment to their students by ensuring equity and opportunity for all students, providing rigorous academic opportunities and implementing superb instructional practices across both schools. 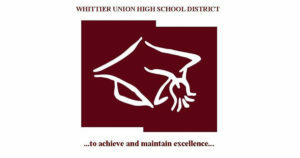 Whittier Union High School District, formed in 1900, operates five comprehensive high schools, one continuation school, one alternative studies program and one adult school. Hundreds of college-bound students from across the Whittier Union High School District will take their first steps toward their academic futures during College Signing Day ceremonies. 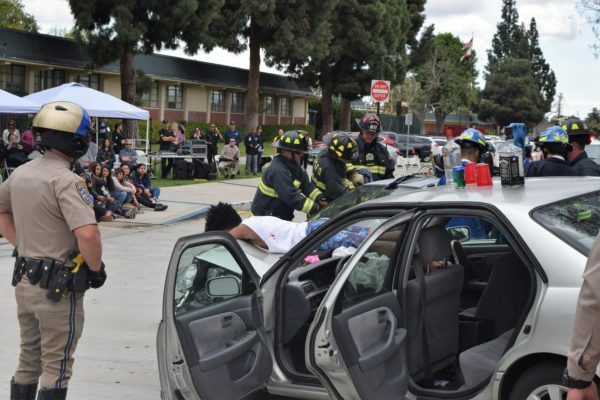 Santa Fe High School will celebrate at noon Wednesday, May 1; La Serna and Pioneer high schools will celebrate Thursday, May 2; and California and Whittier high schools will hold their events on Friday, May 3. In addition, top students from La Serna, California and Whittier high schools will attend UCLA’s National Signing Day with Michelle Obama on Wednesday, May 1. Three Whittier Union High School District administrators have been named Association of California School Administrators (ACSA) Region 15 Administrators of the Year. La Serna High School Principal Ann Fitzgerald, Central Office Administrator Carlye Marousek and Assistant Superintendent of Business Services Dr. Monica Oviedo were selected by the Whittier Area School Administrators local chapter for the honor. Region 15 is composed of districts across Los Angeles County. The team will be recognized at a leadership conference on Monday, April 29. California High School teacher Doug Nordquist was honored with a Patriot Award by California Employer Support of the Guard and Reserve (ESGR) on April 5. The award recognizes individuals who provide outstanding patriotic support and cooperation to their employees. Nordquist, the school's band director, has been an educator at Whittier Union for 38 years, 23 of those at Cal High. ESGR, a Department of Defense program, seeks to foster a culture in which employers support and value the employment and military service of members of the National Guard and Reserve. 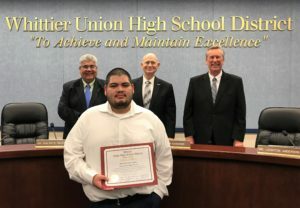 Several Whittier Union High School District schools have been honored for achieving high academic growth, with students consistently making academic gains faster than similar students at similar schools. Pioneer High School was honored with the CORE Districts' Academic Growth Award for achieving three years of success in math. California, Santa Fe and Whittier high schools were honored with High Impact Badges for their success in English language arts (Cal) and math (Santa Fe/Whittier). 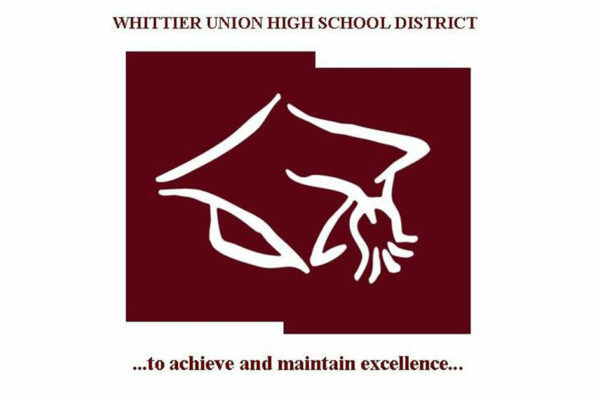 Several Whittier Union High School District schools have been honored for achieving high academic growth, with students consistently making academic gains faster than similar students at similar schools. Pioneer High School was honored with the CORE Districts' Academic Growth Award for achieving three years of success in math. California, Santa Fe and Whittier high schools were honored with High Impact Badges for their success in English language arts (Cal) and math (Santa Fe, Whittier). 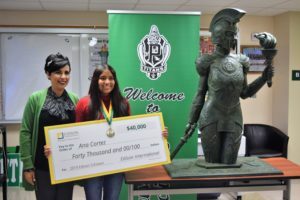 Pioneer High School senior Ana Cortez received the shock of her life when she was surprised with a $40,000 Edison scholarship while sitting in her AP Chemistry class on March 20, surrounded by friends, classmates and teachers. Cortez is one of just 30 Southern California high school students to be named a 2019 Edison Scholar.